A day and two showers after completing my first obstacle race, I’m still finding bits of mud in all sorts of places and have new bruises popping up. Ouch! Stronger than the aches, however, is this weird feeling of having been inducted into a secret society; I now see obstacles in everything! Tall fence? It’s a wall climb. See red and white tape? It must be leading to an obstacle course. The best thing about obstacle racing, I’ve found, is that it forces you to truly live in the moment. My self-confidence is reinvigorated and I’m thrilled with the whole experience. Once you’ve washed off the mud and got into clean clothes, what’s still left is a strong sense of achievement. A ‘whoa did I really do this?’ kind of feeling. I have also been re-introduced to the 5-year old inside of me that wants to wear her medal all day, errrday. 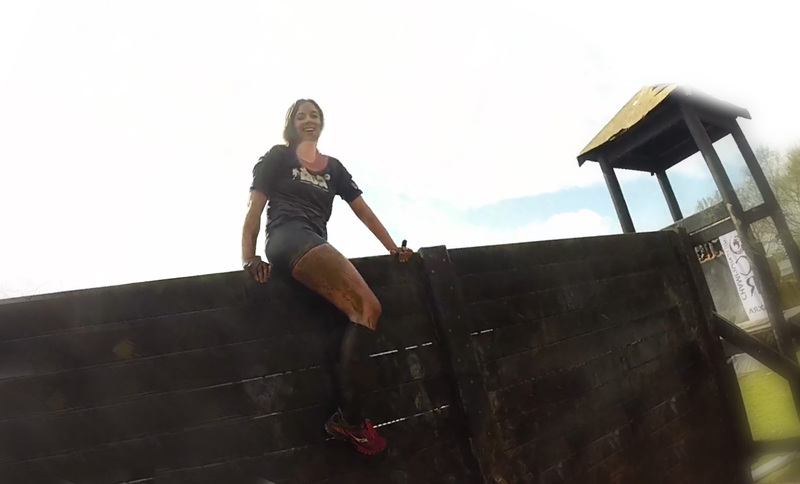 On top of the second-to-last obstacle, a 7ft wall climb. After two sad tries and new hip bruises, I was ready to sit down and cry about it. But I pushed myself to *really* try just one more time and, with some help from V and the course marshall, I made it! Despite knowing better, I did drink some swamp water at the beginning of the race from pure surprise at how cold it felt. Making a shoulder-high swamp water the first obstacle of the course was a brilliant move – big shock and a great way to get into the race mindset. We then spent ages running over fields and roads until we got to the next proper set of obstacles. From this point onwards, the race really heated up and it was obstacle after obstacle until the very end. – The cotton gloves were a mistake. I knew better than to wear cotton during the race, but it was an impromptu decision on the day. – I wish I’d pulled the socks up over my knees (or not wore shorts). My knees got scraped so badly I wince every time I have to bend them. – The high-fives exchanged after completing a tough obstacle are the most energising high-fives there are. – The OCR crowd is awesome and here’s a shoutout to the lady who helped me squeeze into an especially challenging pipe obstacle. – I absolutely hated the half-pipe as the final obstacle (I failed at it twice) – it was a bit of a letdown having to skip the final obstacle after going all out on the rest of the race. Although we signed up for fun – this race was actually intended to be our warm-up for the Allianz Stadium Spartan Sprint in May – we did well in the end, having caught up with some of the previous heat halfway through the race. The best thing about obstacle racing, I’ve found, is that it forces you to truly live in the moment. No matter how scared I was or stressed before the race, once it kicked off, that was it – I was in it for the better part of the next two hours. I was fully focused on each obstacle, getting past them as quickly and carefully as I could. That’s got to be what makes OCR a ‘whoa’ experience and I can’t wait to do it all over again, in a few weeks’ time.